At Lake Norman Signature Pools & Patios, we can turn your Mooresville house into a dream home with pool deck paving! Pool Deck Paving in Mooresville – A swimming pool can be a fun addition to your residential property in the Mooresville & Lake Norman, North Carolina area. With gorgeous temperatures throughout the year, this is an area where you will greatly benefit from having your own personal swimming pool. 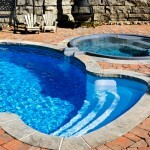 As you consider adding a pool (or even if you already have one), you can also look at options for pool deck paving. You no longer have to stick to a certain color scheme or design; instead, choose a pattern that fits with and reflects your own personal style. At Lake Norman Signature Pools & Patios, we offer customized pool deck paving that will help your yard really stand out from others on the block. We can lay beautiful stamped and stained concrete patios that show off your personality. This adds luxury and also adds a safety measure, since smooth and flat pool decks tend to become slippery when wet. If you are in the process of building a new home, it’s not too late to add a swimming pool with customized pool deck paving. This will turn your house into a dream home. We work directly with the luxury home builders at Chad Goodin Signature Homes and have laid custom pool deck paving for various clients throughout many neighborhoods in Mooresville. Instead of choosing a basic brick or concrete design, allow our experts to design you a stylish and elegant pool deck that you will be proud to show off to family members and friends. 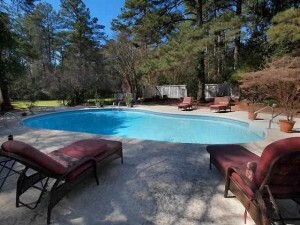 We can even schedule a timer to count down the days until your pool will be complete. Get started by calling us today at Lake Norman Signature Pools & Patios! At Lake Norman Signature Pools & Patios, we proudly offer pool deck paving services in Mooresville, Cornelius, Davidson, Denver, Huntersville, and Lake Norman, North Carolina.